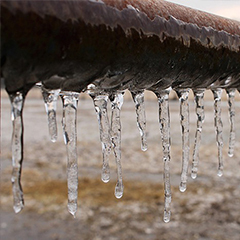 Preventing your pipes from freezing is a relatively simple process. Surprisingly, many homeowners still make the mistake of underestimating the effects of cold weather on pipes, and end up with thousands of dollars in damage, not to mention a damaged pipe in need of repair. When water freezes within a pipe, it stops the flow of fluid and exerts a pressure of over 2,000 pounds per square inch, causing the pipe to burst. A burst pipe releases 100 gallons of water per hour, causing severe damage to homes and businesses. This December hasn’t just been about holiday festivities and hot cocoa; for many, the season has taken a nasty turn. 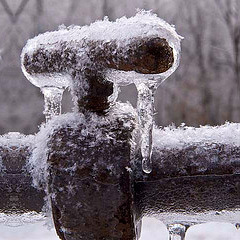 Dropping temperatures across the nation have caused mounting problems from dangerous road conditions to freezing pipes. In Nebraska, an emergency cleaning company reported as many as five calls a day for help with recovering from the damages caused by burst pipes. Many residents have had to evacuate their homes and many businesses are closing their doors. During cold weather roofs, gutters and downspouts can be damaged by extreme conditions caused by heavy snow and ice. Radiant roof and gutter heating and deicing systems have proven extremely effective in preventing the problems caused by snow and ice that can buildup on and in gutters. Ice dams can eventually cause roof leaking that leads to water damage, and ice and snow buildup can destroy gutters and downspouts. 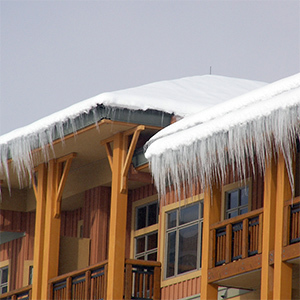 Roof gutter trace cables can be installed to keep trouble spots on your roof ice free, facilitating proper drainage.